Are you a supertaster? Take a test and find out. I am, as I already knew, a normal taster. And as my sense of smell diminishes, my desire for intense tastes ramps up. I've just written a post about all this over at eat our brains, but if you just want the facts, just go take the test. We took a break from weird vegetables tonight. In fact, we kind of took a break from dinner. Tonight we had a couple of Vietnamese spring rolls and cheese and crackers for dinner. I had read a recipe for boursin, and although I did not want to make the recipe tonight, I thought that Bob might really like boursin. As part of my scheme to corrupt Bob, food-wise, I have been buying him chevre. He had it in a salad and subsequently asked for it. So boursin, which is a smooth cream cheese, in this case with garlic in it (Bob loves garlic) was a great idea. Boursin is French, but as French cheeses go it's sort of the Philadelphia cream cheese of France. It was invented in the fifties, unlike a lot of French cheeses which were invented during the Crusades or something. Boursin is not like Saint Nectaire (which is ancient) or Crottin de Chavignol (which dates back to the 16th century) or Brie (which the Emperor Charlemagne tasted in 774.) But it was quite nice tonight. The only problem is if we go from trying exotic vegetables to trying exotic cheeses, we will up our calories AND spend a great deal of cash. 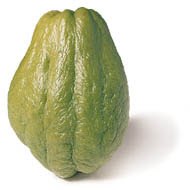 But maybe before I go back to vegetables, I could try a Pont l'Eveque. It's a rich creamy cheese, like brie. And it's ancient, which gives it snob appeal. And it goes good with Pinot Noir. What's not to like? Peyote would make for an interesting dinner, he said. Do you like it? I asked. Bob sent me a picture of what I'm missing. That's my car. I think it's really quite pretty looking. I asked him if he could go out and polish it up and he said if I really insisted he would go out and pour water on it. Some day I suspect I'll get the doors open. I'm in a coffee shop, using a WiFi system that is a bit overloaded and so won't let me send out email. But I think I can post. I'm in Cleveland where, at this moment, I believe it is actually warmer than Austin. 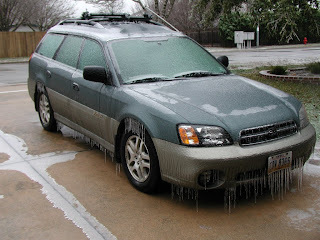 Bob says there is ice on my car (which is parked on the driveway in Texas.) In Cleveland, it is raining, but above freezing. But they'll switch places this afternoon as the temp in Cleveland drops. I went to see my mom today and took her to Bob Evans, her favorite place for lunch. I was worried that after two months it would take her awhile to figure out who I was, or that she might have even forgotten me. But when she saw me, her face lit up with recognition and she stood up and said, "I guess I'm going out?" They told me that a couple of weeks after we moved she seemed to go into a bit of slump and started napping during the day. She rarely does that. But that she seemed to come out of that. They are talking, though, that she may have to be moved from the assisted living building to the nursing home building. I worry about that. When they changed the carpeting in the hall outside her room she lost functional use of language for a week and I think that moving her into a new building will be like sending her to the moon. But I also understand that she no longer changes clothes and takes more care than technically the assissted living is supposed to provide. So far they say they want to try to put it off, for which I am grateful. I'm sitting in an Arabica (coffee shop) wearing my favorite winter sweater that I'll only be able to wear a couple of times a year in Austin, and outside it's gray and drizzling. It all feels so familiar that I forget I don't live here. I'm flying back to Cleveland tomorrow to do some things--like get a copy of my car title so I can get a Texas license. I know as soon as I get a copy of my title, I'll find my old one which is in some box somewhere... I'll also get a check-up at Cleveland Clinic andcheck up on my mother and see lots of old friends. Some of whom, of course, I have yet to call and who will probably be out of town or busy and if I'd only told them I was coming...but I'll be going back pretty often to see my mother. I'll be online when I can. Ellen brought up celery root, but didn't know how to embed a photo in comments. I don't know how to embed a photo in comments, either. 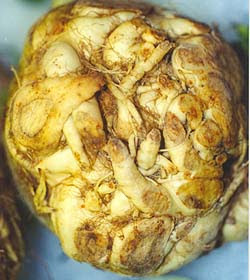 So here's what celery root looks like. I did not make rutabaga yet. So Opa has joined our list of veggies. 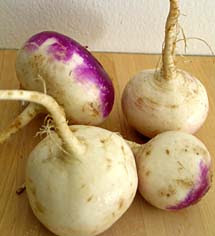 This is what turnips look like. Just because we have been discussin them in the conversation about parsnips. They are not as cool as parsnips. Turnips are usually not the star of a dish. They're kind of a support, like potatoes only more so. Ellen, you mentioned that when you went looking for parsnips, there were three vegetables in the bin and you guys figured you could identify two of them as turnips and parsnips. 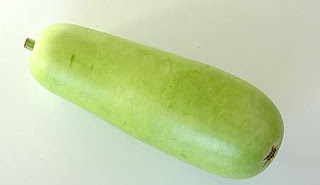 Maybe the third was rutabaga? That's the little bugger down there to the right. 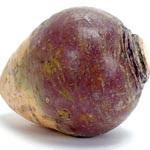 I've never cooked with rutabagas. Poor Bob. More weird veggies. Sometimes I tend to get stuck on certain foods. I go to the grocery and tell myself I'll get something different but there I am, picking up the same thing. This last month it's been parsnips and edamame. 'What are these?' Bob said the first couple of times we had something with parsnips in them. And then the next couple of times, 'You're really into parsnips, aren't you?' Luckily, he doesn't mind. 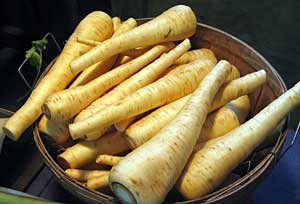 Parsnips are kind of like carrots only white and more woody. I'm sure you could eat them raw, but I like them braised or roasted. Like carrots, when you roast them they get sweeter. I toss them with a little olive oil and salt and stick them in the bottom of roaster and let them cook in the oven until they are, well, cooked. I roasted a chicken and put them in the roaster under it with some onions and turnips and potatoes. I thought maybe I would get all excited about root vegetables. The turnips were okay, but I'm not all excited about root vegetables. I just like parsnips. They make me feel like I'm doing something interesting with dinner. Although actually they are really old fashioned. Not some new johnny come lately vegetable like tomatoes or really faddy like celery. The other neat thing about parsnips is that a few people have been eating them steadily so I can find them in the grocery. Not like galangal, another obsession of mine, which I can only find online. And edamame? Some other time maybe I'll talk about edamame. It's a new year in a new town. I've spent enough time on the silly stuff like finding a new doctor and a new vet, now it's time to start changing into Maureen in Austin. Tonight Bob and I are trying yoga. Tomorrow I might very well feel very old. You can talk about girl power. There's a formal term 'manpower'. But 'woman power' and 'boy power' don't seem to work in English. Before I could go any farther than that, I fell asleep.